It makes sense that perhaps the best way to see Alaska — especially for visitors with limited time — is by air on one of the charters that specialize in Denali. Fly into the wilderness cathedral of Alaska Range mountains surrounding 20,310-foot Denali, the tallest peak in North America and land on one of the mountain's glaciers. Prices for flightseeing to Denali or any other spot vary widely, ranging from about $120 to $500 plus fees, depending on the length of the trip, the departure point and whether there will be a landing as part of the tour. That might seem steep, but on a bluebird day, few trips deliver such gawk-worthy moments as you soar past sheer granite faces and above glaciers. "Flightseeing is getting more and more popular in Alaska," said Tony Bannock, office manager for Regal Air, based in Anchorage. "It's the way of the world. When we started (in 1982) everybody wanted to hunt and fish. Now, it's ecotourism." He's not alone in that view. Sarah Leonard, president of the Alaska Travel Industry Association, noted that 13 to 15 percent of visitors in recent years book flightseeing trips. In 2016, 13 percent (about 24,000 people) did, according to the Alaska Visitor Statistics Program. "Talkeetna has become a destination," said Suzanna Rust, co-owner of Rust's Flying Service, which purchased Talkeetna's K2 Aviation in 1996. "People are discovering it's a cool little village. At the same time, they can fly up and see all the granite walls and rivers of ice (in the Alaska Range). On clear days perfect for flying, Rust noted, K2 may make more than 50 flights to North America's tallest peak. And while the Denali flights may be Alaska's best-known flightseeing tour, visitors' aerial options don't end there. After all, 75 active Alaska business licenses describe their operation as "scenic and sightseeing transportation," according to Alaska's business license database. Rust's and Regal are among the Anchorage flight services that cross Cook Inlet to Chinitna Bay in Lake Clark National Park and the Brooks River in Katmai National Park in search of brown bears feeding on salmon. Bear-viewing trips are available out of Homer and Kodiak, too. Even though Denali remains Regal's most requested flightseeing tour, "Bear viewing gets more and more popular every year," Bannock said. "If there was any way you could get a bear eating a salmon on Denali, that would be perfect." Typically, Regal pilots make early-season scouting flights. Usually, the grizzlies are up and about by May 10, and the season runs into September. The company provides a pre-flight safety briefing in Anchorage. "At Brooks, the brown bears will walk beneath the boardwalk (spanning the river). But we never approach closer than 50 feet." Knik River Lodge glacier tours start less than 60 miles from Anchorage, leaving from Knik River Lodge at the end of Knik River Road in the Matanuska-Susitna Borough. The lodge's front lawn doubles as a helipad for helicopters from Tanalian Aviation that take groups of two or three people to the Knik Glacier, less than five minutes away by air. Perhaps the most popular trip is dog sledding on the glacier or just a glacier landing. But it's great just to fly over it, too, to view the icefall and the mountains. You'll see the Knik Glacier in all its glory, as well as Lake George and a couple of the feeder glaciers. Less than an hour south of Anchorage in the ski community of Girdwood, Alpine Air will fly you well above the Mount Alyeska tram to land on glaciers, or out to Prince William Sound to spot calving glacial ice. In peak season, helicopters depart six times a day from the Girdwood Airport. You can take a 30-minute flight, but some say a 60-minute tour with a glacier landing is even more fun. A walk on the glacier — and a sip from a glacial stream — will help you cool off in summer months. The 60-minute tour costs $389 per person, with a two-person minimum. Wrangell-St. Elias National Park and Preserve is the nation's largest national park, featuring 14 of the 20 tallest peaks in North America. You can take a regularly scheduled flight from Chitina to McCarthy on the edge of the park to avoid driving the rugged McCarthy Road from Chitina to the small town. Depending on the weather, your flight, operated by Wrangell Mountain Air, might take you into the mountains and through the Fourth of July Pass. You'll see rock glaciers and maybe some critters. On the other side of the pass is the giant Root Glacier. You'll fly right past the old copper mine structures in neighboring Kennecott before landing in McCarthy. Another option is to take a two- to three-hour drive on the gravel-surfaced McCarthy Road to park at the McCarthy footbridge, where you'll make your way over to the airport and fly from there. The 400-square-mile Columbia tidewater glacier has retreated 10 miles since 1982, but there's still plenty of ice, and the warming climate has triggered a surge of calving, during which large pieces of ice break off and splash into Prince William Sound. "Presently, the Columbia Glacier is calving about 2 cubic miles of icebergs into the ocean each year," said William Colgan of Colorado University's Cooperative Institute for Research in Environmental Sciences. "It is astounding to watch." A convenient way to see it is to book a flight to Valdez with Ravn Alaska. Try to get a window seat on the left side of the plane. When you land in Valdez, you can circle back by boat on a charter for a Columbia Glacier view from the water. Other Valdez flight services offer tours of Columbia and the Valdez Glacier. Commercial flights into the state capital of Juneau offer a great view of Mendenhall Glacier. But to land on the glacier, try flying with TEMSCO Helicopters in their A-Star 350s. When you check in for your safety briefing, you'll get a pair of glacier boots that fit over your street shoes. You'll leave from the airport and make a breathtaking ascent over the top of the mountain. Then you'll follow the valley to the glacier, where you land. From there, a guide will show off the nearby glacial moulins, near-vertical cavities through which surface meltwater drops into a tunnel. Don't miss the chance to sip some glorious glacier water. Era Helicopters fly from a base on Douglas Island south from Juneau to the Taku Glacier, south of the capital city. When you take off, you'll get a nice view of downtown Juneau, including the Mount Roberts Tramway, which leaves right from the cruise dock. From there, you'll continue down Gastineau Channel to the Taku River. Then your pilot will take a left turn and head up the river valley to the face of the Taku Glacier. You'll get a great view of the deep-blue ice that is exposed, in sharp contrast to the muddy Taku River. Typically, your pilot will make a sweep in each direction, so everyone gets a chance at some great pictures. From there, it's up and over the face, across the rugged, crevasse-filled ice wall. You'll land on the icefield — well away from any crevasses. Depending on the weather, you'll take a different route back to the base across some beautiful, remote mountain meadows. Those are some highlights for Alaska flightseers, but Denali trips remain at the top of many must-see lists. You can catch a flight right out of Anchorage, but that's more expensive than driving north to Talkeetna and flying with K2 Aviation or Talkeetna Air Taxi. 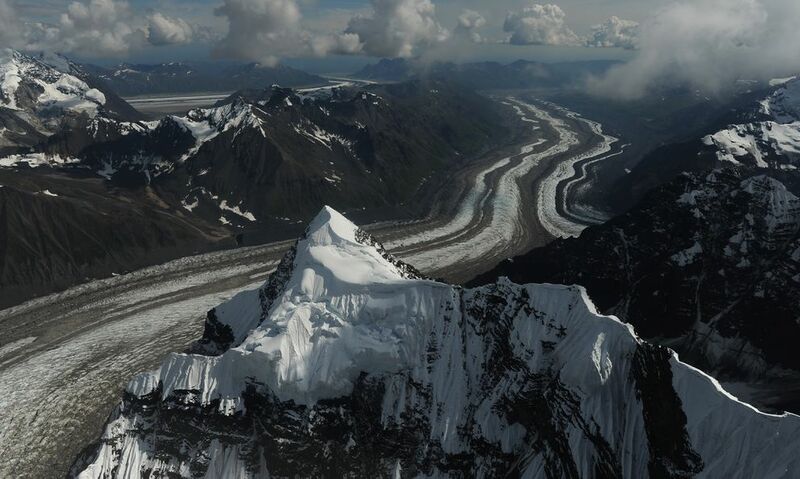 Both companies offer a selection of tours that include great views of the Ruth Glacier, the Wickersham Wall, the climbers' base camp at Kantishna Glacier and the Denali summit (weather permitting). Particularly memorable is a tour that includes a glacier landing. Most pilots' favorite glacier is Ruth Glacier, because it is so spectacular and the runway is well-marked. But the clouds move in and out quickly, so several other glaciers are available if the Ruth is socked in. "Alaska Range weather certainly is the crux of our business, with every year unique," said Paul Roderick, who's owned Talkeetna Air Taxi since 1996. "Some seasons are dry and sunny with at least 20 good flying days per month. Others have the opposite effect, 20 wet days." Keep in mind that weather in Alaska mountains can change rapidly. 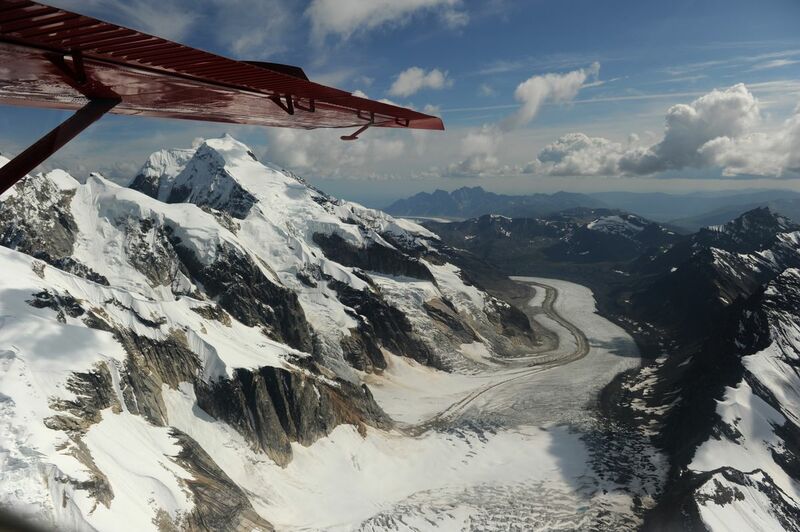 In 2013, six tourists on a Mount McKinley flightseeing trip with Talkeetna Air got an extra dose of adventure when their pilot, concerned about a light snowfall, landed his Beaver on Ruth Glacier and decided to stay put because of deteriorating weather. The passengers spent two nights huddled together in the aircraft with basic gear, such as sleeping bags, a stove and food. Then Park Service rangers hiked in more supplies to the stranded passengers, who flew out a day later. There were no injuries and all had a stirring tale to tell when they got home. "The mountain is almost like a living, breathing organism," said Roderick, who's flown in the Alaska Range for 27 years. "Hopefully you don't ever get too comfortable with it. It doesn't matter how many years of flying you have, the conditions are always changing up there — the visibility, lighting, blowing snow, fog. It's never the same." While a little more spendy, helicopter flightseeing offers an exciting alternative. Enclosed in Plexiglas with no wings to peer over, even trips as short as 30 minutes can provide exceptional views. Wherever you want to see, there's probably a flightseeing business nearby. Among the locales where tours are offered: Kenai, Soldotna, Tok, McCarthy, Homer, Girdwood, King Salmon, Talkeetna, Juneau, Ketchikan, Fairbanks, Skagway and Kantishna.